The NFPA Certified Hazard Recognition Specialist Program (CHRS) was created in 2017 after discussions with fire service professionals indicated a strong desire to have a credential for fire fighters that highlights knowledge of fire and life safety concepts and the requirements found in the 2015 edition of NFPA 101®, Life Safety Code®. Through these discussions other stakeholder groups that would benefit from this certification were identified including, but not limited to, facility managers, building engineers, maintenance professionals, safety professionals, and security professionals. The exam is based on the 2015 edition of NFPA 101®, Life Safety Code®. It is the candidate’s responsibility to obtain this reference source for study purposes and to have present during the examination. It is the only reference source allowed in the examination room. If you would like to purchase this NFPA document please go to the NFPA website at www.nfpa.org/catalog. 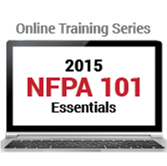 NFPA's first interactive online training for Life Safety Code users teaches you how to navigate and implement the 2015 NFPA 101.